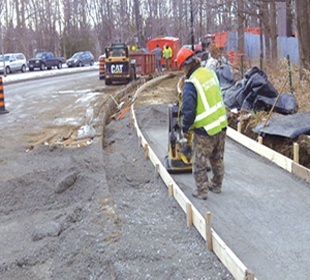 The following is a guest article from Bill Michaels at Patterned Concrete. Nothing beats that “fresh, new look.” Unfortunately, too many things in life lose their luster if not properly cared for. That can be the case even for something as stable as stamped concrete, but it doesn’t have to be. 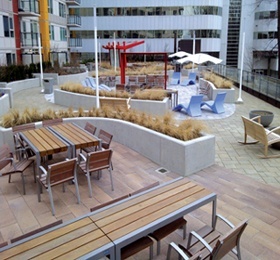 Your new installation is beautiful, whether it's your patio, walkway or even indoor surface. With proper care it can keep up its appearance and luster for many years. How Should I Do Regular Cleaning of My Stamped Concrete? Basic cleaning is plenty to keep your stamped concrete in good shape. There’s no fancy tricks or gimmicks here. If we’re talking about indoors, simply dry mopping or wet mopping is usually enough. You can use a diluted liquid cleaner if needed. Be sure to rinse with a wet mop and clean water afterward so you don’t end up with spots that look “washed out” where soap dried. Placing furniture on the surface? Use felt pads under the legs and avoid dragging furniture across the floor. In highly-traveled areas, a throw rug or a doormat will help prevent wear and the appearance of a “path” across the floor. Outdoors, things aren’t much harder. Sweeping or hosing off the surface regularly will usually do the trick. Power washing is safe to use if needed, as well. And a diluted liquid cleaner works well, but be sure to rinse it off thoroughly. If leaves, twigs, or litter tend to accumulate, a leaf blower will do the trick. Both indoors and out, clean up spills quickly. Otherwise, they could lead to stains. In the event a stain does form on your stamped concrete surface, a little elbow grease can usually help get rid of it. Using warm water can help break down a lot of stains. If you’re still having problems, there are a couple easy steps you can take. I already mentioned power washing, and that can do the trick especially in the case of stains. An alkaline degreaser can help break down grease and oil, and when used according to instructions should not harm your stamped concrete. It’s best to ask your contractor for products he or she recommends. Remember that there’s grease even in dirt, so even if you wouldn’t classify your problem as a “grease stain,” this type of cleaner chemical may still help. If these aren’t enough, it’s best to call your contractor and see what can be done to fix the problem. When your stamped concrete surface is installed, a sealant is applied to preserve and protect it. But this sealant is going to start breaking down at some point. Taking the steps above will help preserve the life of the sealant. If you follow the advice here, you should be able to get two to three years out of the initial coat. That can vary depending on the use of the surface as well as the climate. Obviously, harsh winters or scorching summers can speed up deterioration. In any case, a new coat of sealant will need to be applied after a good period of time. Doing this in a timely fashion will help keep the underlying surface in better condition. It’s possible to do this yourself, but we do recommend calling your contractor instead unless you’re a skilled do-it-yourselfer. Before applying a new layer, the surface should be thoroughly cleaned and dried. Otherwise, irregularities can form in the surface. It does take planning to make sure you don’t trap yourself in a corner and that you smoothly coat the whole surface. Of course, if you notice excessive wear—for instance, across the main path where everyone walks—you should look at having it sealed sooner. Proper sealing will help preserve the color and keep it from fading. Yes, it’s possible to restore a faded surface, but it makes much more sense to preserve it in the first place. There’s not a whole lot that needs to be avoided and it’s most obvious. But we’d like to include them anyway, just as reminders. Try not to let unnecessary materials pile up on your stamped concrete surface. Fallen leaves, a tarp, or other items that tend to pile up could also be bad. These can trap moisture, which can eventually cause stains. Another common cause of stains and damage is de-icing salt. This corrosive chemical could lead to flaking or peeling of the surface. 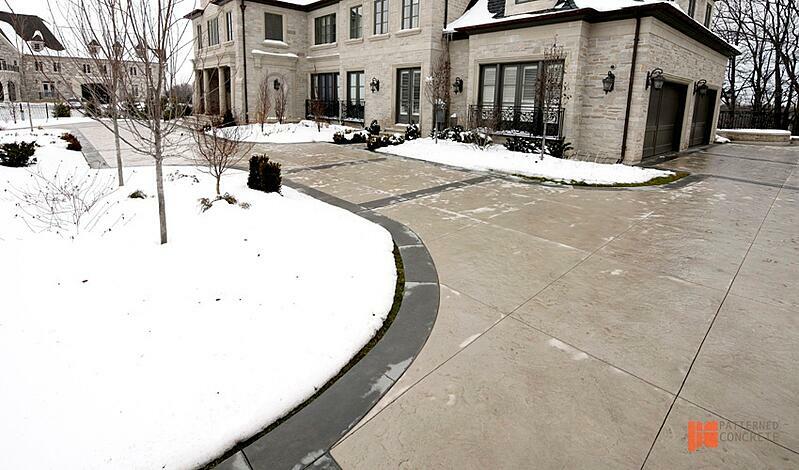 So don’t use salt on your stamped concrete surface. But also be mindful of “drip-off,” such as the snow that accumulates on your car that melts falls off. Try to park away from the edge of the driveway if your stamped concrete leads up to it. If salt tends to get tracked onto the surface on boots, shoes, or other items, clean it off as well as possible. While we’re on the subject of snow, we’d also mention that it’s not a good idea to use a plow or a shovel with a metal edge. Either of these can easily “ding” your surface. A snowblower or a plastic shovel is much safer. Finally, remember that even concrete, as strong as it is, can be broken with enough force or weight. If you have to move a vehicle onto the surface, be especially careful to keep it away from the edge, where a crack is more likely to take place. And if you’re playing Thor—or just DIYing—remember not to let your sledgehammer go crashing to the ground. Concrete will withstand a lot, but it is tough to repair when it’s broken. Stamped concrete can be an absolutely beautiful decoration for your home, inside or out. And being low-maintenance makes it even more attractive. Follow the simple advice we’ve given here and you’ll be able to enjoy the beauty of your stamped concrete surface for years to come!